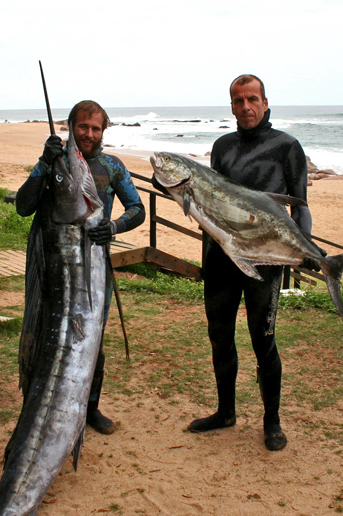 The Euro-Africa CMAS Spearfishing Qualifier in Peniche Portugal is over and our boys have done us proud. The results were pretty grim and you could be forgiven if you thought the guy blew it. 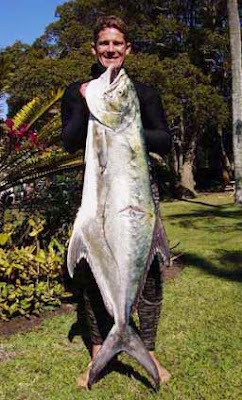 But you need to have an idea of what they were up against and realise they actually did ok.
Well at the end of the day the mission was to qualify for the World Spearfishing Championships, and they achieved this! So hats off to the guys. Some feedback from the proverbial 'horses mouth'. As I am sure many of you have seen from windfinder, windguru etc, the Portuguese coastline around Peniche is hammered by wind. In the almost three weeks we were there we had about 4 days of light winds - the rest of the time it BLEW. The two official comp zones were very different from ont to the other. The northern zone had quite a lot of reef in the northern 3/4 with a long beach in the south and some reef right ate the south (bear in mind that the zones were about 11 km long). The southern zone had limited reef and long stretches of sand (hence the continual poor viz). Most of the reef was located in the north with some very good patches of reef in the south (but viz tended to be poorer in the south - if that is possible). The spearfishing the last few days has slowly gotten worse. And now the conditions are bad with some swell and wind all thrown in together. Yesterday seemed like that last gap and a few guys tried to jump in and make the most of what conditions were diveable. 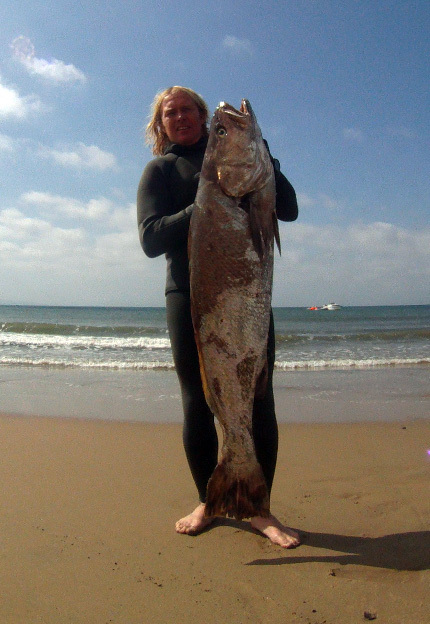 Hey bud thought you might be interested in my Garrick I shot yesterday; I shot it out of a shoal of snoek. When I first saw it I thought it was a GT at first, but was the biggest Garrick I have seen! Every time I get one it amazes me at the power of the fish! It tipped the scales at 22kgs a personal best! This is with out a doubt the biggest Garrick of the year this side, and possibly the biggest over the last few years. Ok ...some guys have claimed bigger but when you look at the picks and fish is no ware near shoulder high then you know they need to check the scale. This weekend saw some good diving on the natal coast for a change. The forecast looked good and ment that a few "Vaalies' would come down as always to 'try their luck'. Mark and Pj traversed the Vaal river and broke through the 'Boerewors Gordyn' and ventured south to seek out some diving. PJ is normally the first to admit his shortcomings, and what they might lack in skill and experience he makes up for in shear determination. He has a saying that, "nothing is impossible for a Vaalie"
Anyway I have been hearing reports of guys having some good diving this weekend and the best has to be the 2 Vaalies. They kinda took the cake from us this weekend! What a weekend man! I'll send you a short write up (and yet another story) soon! Basically, Mark and I went out of Saturday with Alan Potter to Aliwal on his awesome little duck. First Dive of the day, I got my first Saily ever! 45kg! Stripped my gun and belt reel then dragged me on the surface for a good couple of minutes! Epic! I'm still in the clouds! Then, we headed to Green Point to dive up against the rocks, and Mark goes and shoots a 19kg Garrick! The boat was full with only two fish on it! To top it all off, I got in, swam right up against the rocks and wham, in about 3m of water I shoot a 13kg Prodigal Son. Too much man! Epic! 3 personal bests in about 3 hours! I'll send you a proper story later. Wow, this was the best weekend of my life! I still can't believe it! Good sized Daga Salmon speared off the wrecks. The late winter this will not be remembered for its diving. The conditions have just been terrible, with cold green water plaguing our coast. Even after a number of westerlies that normally clean things up the sea remained undiveable. This week saw the first break in the conditions and we were able to get back in the water. 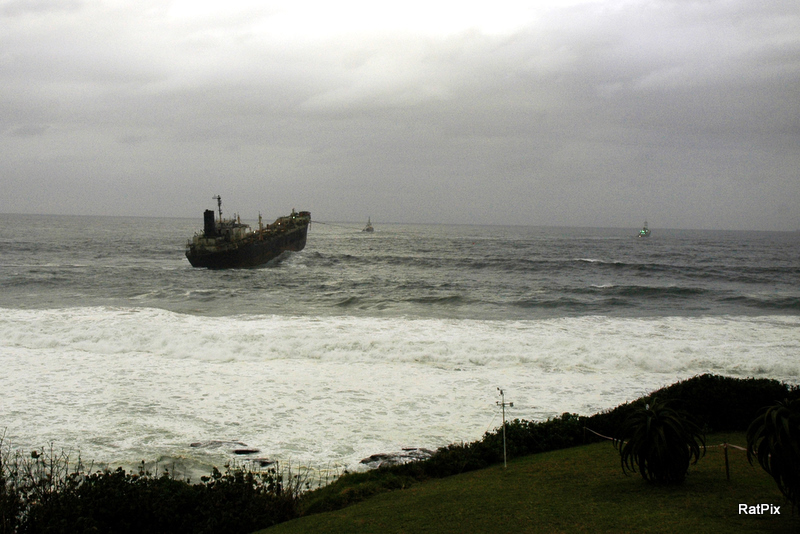 The large swell meant that the only launchable spot was in the bay in Durban. Not a bad thing as you can get to all the wrecks and containers as well as all the reefs further north. The first few spots we looked at were horrible, and diving 28m in only a meter or so vis is not fun. But as we worked our way north the vis improved. We stopped at the wreck of the Fontao, I did not even think to take my camera as the previous spots were not good. As always I am a little slow off the mark and the other guys dived down while I was still prepping tom dive. Not wanting to go over where they had been I drifted back in the current. Knowing that this would probably put me off the wreck and in deeper water than I would have liked I took my time. When I hit the sand the wreck was just visible, and the water was actually very clean. Next thing a whole shoal of Daga came swimming in to have a look and with them 3 or 4 Iggies aswell. What a sight .... absolute eye candy!!! Its times like that you really need the camera. Not wanting to blow the opportunity and land up having night mares reliving the scene over and over in my head I made sure on a fish that gave me a good shot. The wrecks are super fun, but you need to be fit. With the diving being so bleak the 26-28m dives became quiet difficult after a while. We did manage another Daga and some good sized Grunter. Not bad for morning out! After weeks and weeks, and much debate over what was going to be the out come of the wreck of the Phoenix at Sheffield beach. The Phoenix was dragged off and miraculously floated! Some including myself were hoping that it would sink some distance from shore and create a new dive and fishing location. Anyway after 6 weeks and well over 5 million US Dollars later the engineers and specialists got it right. This time there were 2 tow ropes and I am sure a host of other details we don't know about to make sure that everything went to plan. Early hours of the morning cutting the gang plank off started the proceedings. What was interesting is that aside from the fact that there was a huge hole in the hull near the engine room, the engineers speculated whether the stern of the ship would be too heavy and cause problems. The countered the problem by pumping huge volumes of air into the effected sections. On the other hand they also said that it would take a number of hours for the ship to sink as there were many bulk heads and other water tight sections still intact. 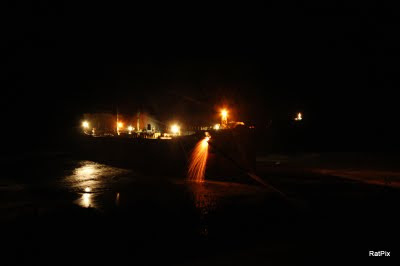 Its hard to see but the puff of dust on the bow was the winch housings breaking off under the pressure. The original plan was to pull the ship on the full high tide earlier in the week, but with no swell they took a chance and waited for better swell. So even though the tide was not as high as a few days ago the increased swell height helped rock the ship off the rocks. The Light bow lifting up in the swell as she made her way. 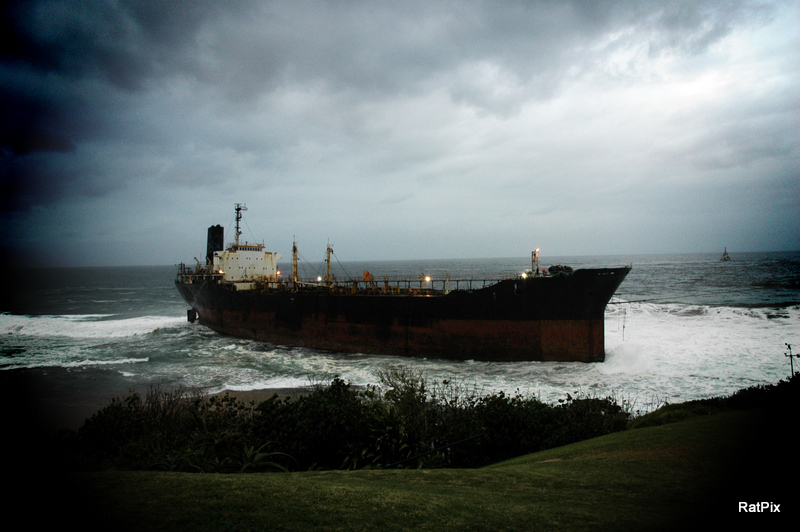 Once the bow was facing out to sea it took a while for the heavy stern to get pulled free. You could see the bow was light as it lifted over the swells. Once the ship was pulled a safe distance they started to flood the bow with water to balance the ship and towed her over the horizon. Here is a short video clip my mate put together of the whole ordeal. Its a classic so check it out. I a sure that there are many happy Sheffield residents at the moment. 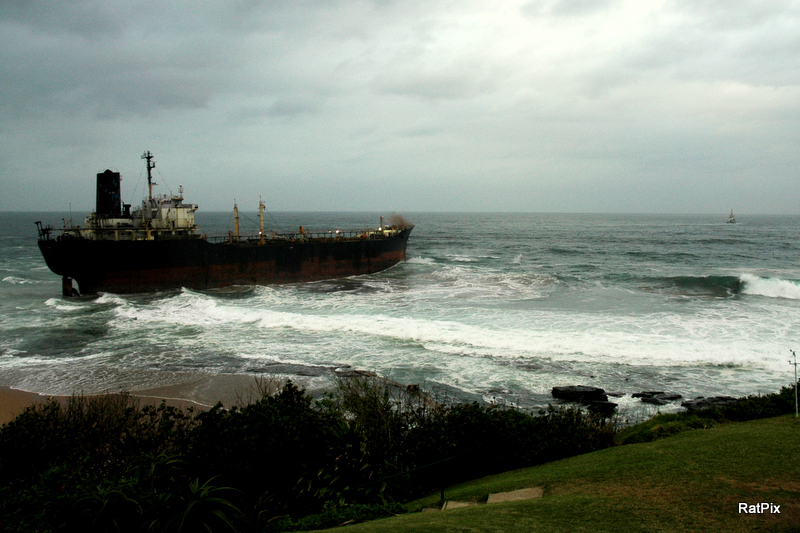 And although we did not get our reef there are rumors that they will sink her somewhere near Aliwal Shoal. I guess this is the end of this little saga and Sheffield can now return to its quiet sleepy self. Here is the next offering my our good man Brod Whittaker. In this vid you will see Jeremy Williams of the dive factory getting some really nice Kakaap up at Milli. The vis is soooo good it makes me wanna go dive.